Nearly two full weeks in Alaska, including a cruise ship and followed by one day in culinary paradise Vancouver, provided a big mixed bag of food to review, which will happen over the next few days. First though I want to welcome Another Day in Wheaton to the local blogosphere; ADiW popped up at the beginning of 2013, amidst my hiatus. Another Day blogs about all kinds of Wheatony things — gardens, traffic, development, other stuff I don’t blog about. Check it out. Any other new-ish Wheaton blogs I should know about? Okay, North to Alaska. Land of the Rising Midnight Sun (hi Japan! You cannot see Japan from Alaska; I thought I caught a glimpse of Russia as we drove through Wasilla but then it hid behind a glacier — might have just been a moose). We flew all day to get there, routed inconveniently through Dallas (American hub) and only minimally fortified with anything edible upon arrival in Anchorage. Tired and hungry, we stumbled down the street a few blocks from the Captain Cook Hotel to try the pizza at Uncle Joe’s (428 G Street), a local joint on a side street where most tourists don’t bother to walk. Uncle Joe’s* is kind of a dive (just the way we like it), with a handful of formica tables, a mostly exposed kitchen, and a staff of teenagers/twentysomethings who seemed to be having a lot of fun. I think they do a lot of takeout/delivery but most of the tables were occupied; we snagged the last one and ordered a slice of pepperoni, which was huge, enough for two, and excellent, teeming with meat, crisp crust, and a fine, inoffensive cheese-sauce balance. * Joseph Stalin was known by Russians as Uncle Joe, back in the day. Despite Alaska’s history of Russian influence, there is no connection between Uncle Joe the Despot and Uncle Joe the Pizzaiolo. Just to be clear. They also had a small but good selection of local microbrews — nearly every restaurant in Alaska seems to have a sometimes-small, always-good selection of local microbrews — and we especially liked the Glacier Brewhouse IPA, hoppy and citrusy and strong but balanced. The King Street IPA was unbalanced, the hops overwhelming all else. Two pints and a good, big slice for $15 (food in Alaska can be a bit more expensive than in the lower 48, but not as much more as we had imagined, and in some cases not any more at all) made a fine end to the day and a fine start to the trip. The next morning we walked a block in the opposite direction to the Snow City Cafe (1034 W. 4th), which unlike Joe’s is one of the best-known tourist destinations and is packed every morning for breakfast, so we arrived 10 minutes before opening, and were not the first ones there. 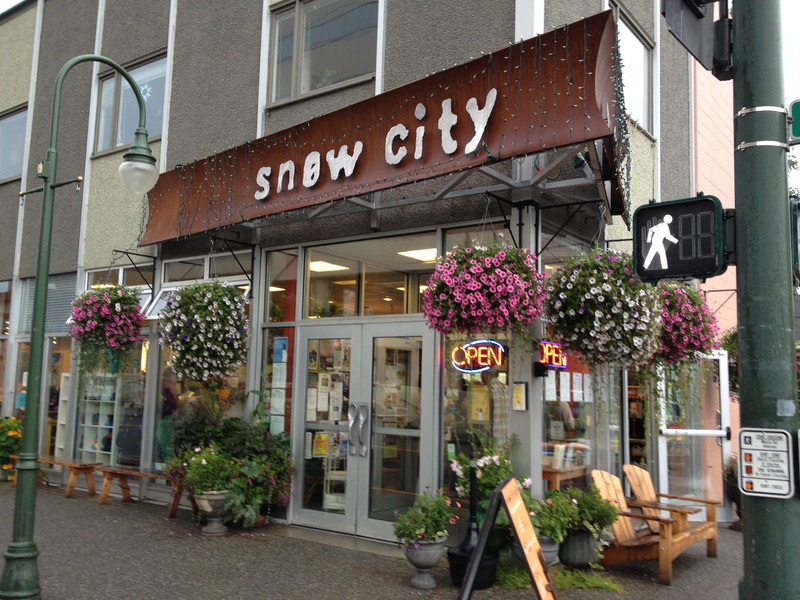 Snow City provides benches indoors to sit in, available even before they are official open, a nice welcoming touch given Alaska’s often inclement weather (it was indeed raining the morning we were there). Touristy restaurants are a dicey proposition, since many of them coast on reputation as they decline in quality, but Snow City is pretty good, even if not quite as fabulous as some reviews might suggest. I don’t have much to compare it to, but I suspect it is genuinely one of the better restaurants in Anchorage. The Kodiak Benedict was worthwhile, with perfectly runny eggs, decent crab cakes, and huge crispy hash browns on the side. Salmon cakes proved less of a hit with our party, but everyone enjoyed the bread assortment, especially the delicious sticky buns and biscuits. We also liked the ambience, with high ceilings and bright natural light through one wall comprised entirely of windows. Large portions, reasonable prices, good way to fuel up for a four hour bus ride (urk) to near the southwest corner of Denali National Park. Next: the food scene at Princess Lodge(s) around Denali. We had heard reports that weekend brunch at Parkway Deli (8317 Grubb Road) is a madhouse but still I underestimated the madness of the house, and the longness of the wait for a table. PD is a local institution for nearly 50 years but somehow we had never been, until recently. Not only was the wait long, but the line was awkwardly arranged, constantly in the way of servers rushing around, and the end of the line was not obvious to each set of newcomers, which added to the feeling of being in the way. Overall the food was solid, especially at the price point. I liked the reuben, and a big/good value at the price, but the accompanying fries were limp and sallow. I tasted the crab cakes on the benedict (which looked good otherwise) and wasn’t impressed but Senior Mrs. Me liked them and that’s what counts. The omelette was pretty good. Lots of good classic Jewish deli/kosher options. The main room is big and loud, with lots of mirrors and odd colors, very strange layout. We were glad to be in a booth, not at one of the close-packed tables in the middle of the room. Service was generally good though a couple of dishes were practically thrown on the table; I guess you have to cut some slack during the brunch rush. I can see why the place is popular — does the dinginess and datedness add to the charm? — but if I had to choose between Parkway Deli and Woodside Deli, it would be a tossup: PD food might be slightly better, but WD wins on decor, convenience (for us Wheatonians) and not having to wait as long for a table (though that’s a tough table too at brunch/lunch rush). I need to revisit Wheaton’s own Nick’s Diner one of these weekends, very different atmosphere and food style but serves a similar local diner brunch/lunch niche. I’ve had less trouble getting out of corn mazes than we did getting from our table to the Mrs. K’s Toll House brunch buffet and back again. Nobody got lost or injured, but was it worth the trouble? We like Mrs. K’s a lot for drinks or dinner, sitting downstairs in the dark atmospheric wine cellar or outside on the patio. For brunch, we were seated upstairs, in an overheated too-quiet room, as far from the buffet as possible. Unless you sit adjacent to the buffet, it ends up being a hike, plus at peak times the line spirals around the room a couple of times. The food was fine but maybe not worth the $30 per person price. Best offerings are in the back of the room, where we found delicious made-to-order omelets, various carved roast beasts, and hot-off-the-press waffles. Eggs benedict looked great but were room temperature at best (perfectly cooked eggs though). Big snow crab leg sections looked iffy, and there didn’t appear to be any implements with which to crack them. They had a big bed of oysters on ice, but I’m very particular about my oysters and I passed these up. Fried chicken, sausages, bbq beef, all merely okay. Good creamed spinach, good Swedish meatballs. Lots of pastries. I don’t know. Mrs. K makes mostly good food, and the brunch spread was fine upon reflection, and yet the food and the logistics and the fact that we didn’t like the room we were in just made it fall short of expectations, somehow. I’m also never sure what to tip at a buffet, which is sort of apropos of nothing except that it added to my sense of non-fulfillment at the end of the meal. The Woodside Deli website is strange: despite their longstanding location just south of the Beltway, across from Snider’s — is that Forest Glen, or Silver Spring or Woodside, or All of the Above, or…whatever. Despite that location, the website focuses nearly exclusively on the Rockville catering arm of the company, and lists the deli menu for “historical value” only, as though the original restaurant no longer exists. The actual hard copy menu, which does in fact exist, has a different design but all the same items, and prices don’t seem far off. No mention online of the restaurant address, hours, etc. Which makes me think this isn’t the right website…but if there’s another one, I can’t find it, and this is the one linked to by Yelp and its ilk. So my first unsolicited recommendation (aren’t they all?) is to upgrade the website. On the other hand, the apparent fact that they are focusing on the catering at the expense of the restaurant kind of came through in our meal this time. We have liked Woodside in the past, and our recent visit wasn’t bad, but the food wasn’t particularly good either: uninspired salads, big but bland sandwiches, corned beef hash that clearly came from a can. The pancakes are decently fluffy, though, and HUGE, like the greasy-but-good potato latkes and also every other item we’ve ever ordered or seen ordered there. If you’re sick of the small plate trend gripping greater DC, Woodside could be the antidote. Hard to avoid leftovers at Woodside — but do we really want them? Service can be good or indifferent, depending who you get. The best part of brunch was the people-watching. Most Wheaton restaurants, especially the Thai and Chinese places, have a diverse ethnic clientele. But Woodside Deli’s customers seem more diverse, in terms of not only ethnicity, but also age, and economic status (judging by attire, personal sanitation, dental work), than any other restaurant I’ve been in lately. That’s intended as an observation, not a judgment, and if (like me) you don’t mind eating at a table next to the occasional person dressed like she earned her brunch money by turning tricks the night before, and on the other side a kid throwing his utensils all over the place…well, if you like this sort of cross-section of America and you like leftovers, but you prefer a local dive to a generic national chain, then you’ll dig Woodside Deli the most.